Finding the right duvet or comforter is often like finding a great pair of shoes – people prefer styles that fit both their personality and their needs. When investing in the quality of natural down, finding the right comforter to fit your personal style can depend on making a few key choices. Let us help you navigate the most important considerations to get the right fit for you. Why is down the best choice for comforters? At Pacific Coast®, we love down. It’s the best fill for bedding because nature created this unequaled material that is ultra-lightweight and provides a consistent temperature, year-round. No synthetic can compete with the warmth-to-weight ratio of down. This is important because most people find that the less weight they have on top of them, the more relaxing their sleep. Down also works well in a summer comforter because its natural properties provide a more consistent temperature than synthetic fills. We want our customers to sleep well, they deserve it. Matching your comforter weight to the warmth of your environment is the most important step in selecting the best comforter for you. Many of us sleep in warm environments because of foam mattresses, warm climates, increased body temperatures due to age, or even that glass of wine with dinner. When faced with a warm environment, a light weight down comforter or down blanket would be the best choice. When in doubt, go lighter. You can always add a blanket, but a hot comforter can’t be cooled. On the other hand, people who live in cold climates need a thick comforter when the outside temperatures dip below zero and the house just can’t stay warm. Quality in a comforter comes from the details in how it’s made, not how many ounces of down it contains. Sometimes we hear from customers who think that their light warmth comforter is not high quality because it is too thin. Yet, we also hear from customers who love their big, fluffy comforter but are just too hot at night. Down is such a powerful insulator that it doesn’t take much of it to warm you. The key here is getting the right amount of down for you, not packing your comforter with so much down that it’s fun to dive into but you are miserable from sweating through the night. What makes one down comforter warmer than another ? Some people confuse ‘fill power’ with ‘fill weight’ by thinking that a higher fill power down will automatically equal a warmer comforter. To some extent, this is true but there is more to the story. Fill power refers to the measurement of loft, or fluff. It is the true measure of quality and it is tested by measuring the amount of space 1 oz of down takes up. The more space it takes; the higher the fill power. A higher fill power will give you a lighter, more fluffy comforter for a given warmth level. Fill weight is the main driver of warmth. It is simply the number of ounces of down in a comforter. As more down is put into the comforter the warmth level increases. It doesn’t take a lot of down to do its work so looks can be deceiving. Warmth level is the end result of the fill power and fill weight working together to make a warm - or not so warm - comforter. The good news is that in comforters, you can focus on warmth level; no need to worry about the fill power or fill weight. The warmth level is the key measure that will ensure your satisfaction in your new comforter. In down comforters, a luxury experience comes from the lightness, fluffiness and rarity of the down. There is no better feeling than snuggling into cloudlike comfort to start off a good night’s sleep. We have already talked about how a higher fill power will get you more fluff and less weight but there are two more considerations when choosing a luxury comforter: thread count and type of down. Thread count refers to the number of threads per square inch of fabric. The higher the thread count, the finer and more tightly woven the fabric – to certain point. Many people use thread count as their sole measure but more isn’t always better. It’s possible for very high thread count fabrics to be stiff and dense because of the way they are woven and the fiber quality. A good rule of thumb is to not buy anything over 800 or under 200. However, a fabric’s feel and performance over time depends on more than just thread count - particularly when it comes to down-proof fabrics. Different than what you would find in duvets or sheets, down-proof fabrics are tightly woven to do the job of keeping the down inside your comforter. The most important factors in down-proof fabrics are durability and light weight, which is optimized between 230 and 500 thread count. Contrast this with a 1000 thread count fabric, which will feel heavy and have smaller and weaker threads while compromising on down-proofness. If you are using a duvet, you can choose a lower thread count comforter. You won’t be able to tell the difference! There isn’t a difference to the eye between duck vs. goose down. In fact, our scientists have to use a microscope to check the species for each shipment. Goose down is more expensive because it is more rare. Down is a commodity and therefore follows the laws of supply and demand. There is more down available on the market from ducks, than geese, so duck down is more affordable. Fill power is the equalizer between duck and goose down. A down cluster of a certain size will be, for example, 500 fill power whether it is from a duck or a goose. The fill power tells you more about how it will perform than the species. The difference between the two types of down comes in at the very high fill powers – above 600 fill power. 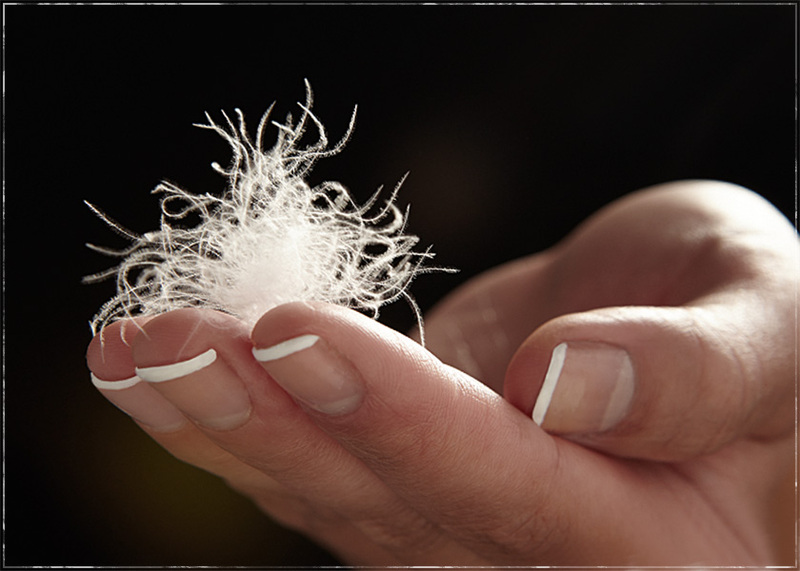 Goose down is typically available in higher fill powers than duck down. And, our last distinction comes from origin. Down coming from colder regions of the world will be larger and fluffier. Therefore, the European down from Hungary and France is often higher fill power. Buying a comforter filled with grey duck down will be your best option to save money without sacrificing quality or performance. Why do you get down coming out of down comforters? Down-proof fabric is tightly woven to keep tiny gaps from occurring in the fabric. That’s why you may hear a little crinkle to the fabric, which decreases over time and with washings. There are different levels of down-proofness and these measurements are not reported by the manufacturer to the consumer. The only way to know if you are getting good down-proofness in a comforter is to purchase from a brand that you can trust. Pacific Coast has developed a fabric standard we call Barrier Weave®. Not all down-proof fabrics meet the high standards to qualify to be called Barrier Weave®. We even take it a step further with our unique finishing process that adds even more security. There are two main types of construction in down comforters, the sewn-through box and the baffle box. The comforter is stitched through both layers of fabric in a sewn-through box construction. We often use this construction method in lightweight comforters and blankets since there isn’t a lot of down to loft and a sewn-through box will keep the down more evenly distributed. The sewn-through construction is more economical as well. Its downside is that cold spots can occur at the stitch lines because the down will move away from that area. A Baffle Box design refers to three-dimensional fabric-walled boxes that allow the down to loft to its fullest while maintaining even distribution within the boxes - without cold spots. Baffle boxes have a small opening in the corner of each box so they can be filled with down. This construction creates a smooth look to the top of the comforter. At Pacific Coast, we have gone a step further and developed what we call the Comfort Lock® border. This is a channel that runs around three sides of the comforter to keep the down on the edges separate from the down on top. This way you can stay warm and cozy because the down is concentrated where you need it and you aren’t paying for down that is only hanging on the edges. When choosing a comforter, size is our last consideration. There are many sizes to choose from: Twin, Twin XL, Full, Full/Queen, Queen, Oversized Queen, King, and Oversized King sized down comforters. The decision really is whether to get the size corresponding to your bed or an oversized comforter that drapes off the bed. The European style of comforter is sized to sit on top of the bed with little drape. But, in the US, we tend to like our comforters to hang over the bed, more like a bedspread. If you are looking for more drape, an oversized comforter will fit your style better. Also consider your preference for the fit of the comforter inside the duvet cover, or down comforter cover. Others buy a larger duvet cover with a regular sized comforter to get the draped look without the cost of a larger comforter. Lastly, there is the old tug-of-war problem between couples. Some people take the covers with them when they roll over, leaving their partner out in the cold. Their unfortunate partners really appreciate an oversized comforter so they can keep warm at night too! We recommend checking the size of your duvet cover ahead of time to understand how your comforter will fit with it. While there are several considerations when choosing a down comforter, warmth level is the most important to get right. The rest of the considerations – fill power, thread count, down type, fabric type, construction and size – will help you hone in on your ultimate down happiness and give you confidence in your decision. Buying a down comforter isn’t something you do often since they last so long. Therefore, you want to get it right the first time and choose the right comforter that suits your style. Our customer service team is always here to help you make the right choice. If you aren’t sure, give us a call and we'll talk you through it.